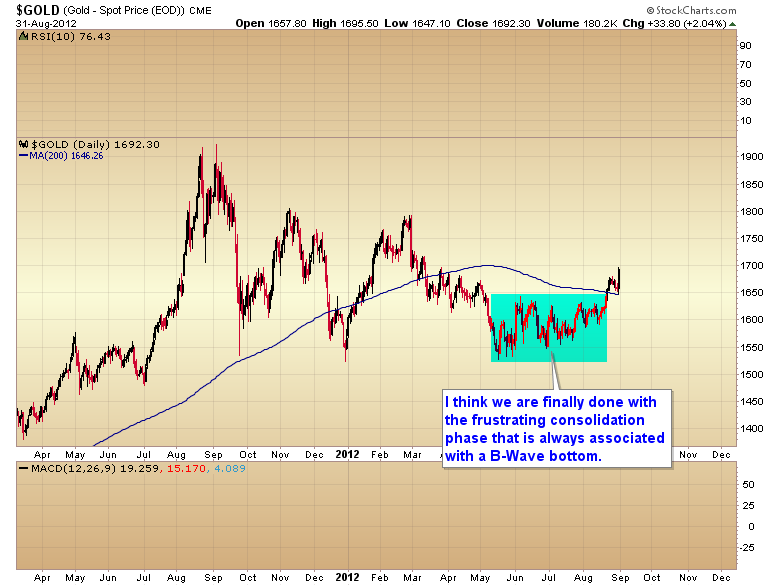 It’s been a great run over the last two months but it may be time to tighten stops on mining stocks. You can see in the chart below that at least during this stage of the new C-wave gold is still inversely tethered to the dollar index, as are miners. 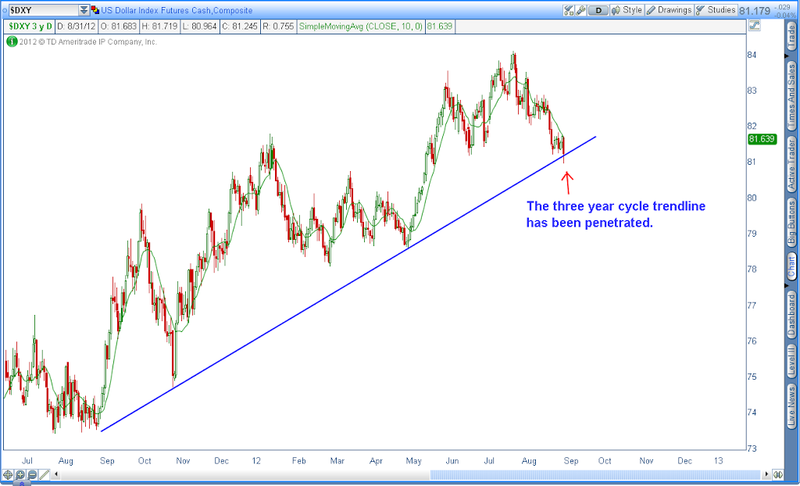 During the period from September 2011 to July 2012 the dollar was moving generally higher out of its three year cycle low and that forced a 10 month correction in the precious metals sector. It’s been my opinion that the three year cycle in the dollar topped at that point, and should drift generally lower until the next three year cycle low sometime in mid-2014 (with occasional counter trend rallies from time to time). I’ve been expecting one more leg down in the dollar to test the February intermediate low before the first counter trend rally. However, this bounce is now on the 10th day and in jeopardy of generating a right translated daily cycle (a cycle that rallies longer than half its duration and tends to form higher highs and higher lows). If that occurs it will probably signal that an intermediate degree counter trend rally has already begun. As you can see in the chart above just as soon as the dollar started to rally gold stagnated, mining stocks started to correct, as did the stock market. If this bounce in the dollar turns into a full-fledged intermediate degree rally then we can probably expect a 3-4 week correction in asset markets. I find it hard to believe that Bernanke is going to allow the dollar to rise and asset markets correct right in front of an election but the possibility definitely exists if the dollar doesn’t turn down early next week. Those of you not willing to hold through a 10-15% correction in miners should probably consider tightening stops, possibly right below Thursday’s intraday low. If that gets violated it would start a pattern of lower lows and lower highs which is generally the definition of a down trend. If on the other hand, Monday morning the dollar is getting hit hard then I think we may see gold test $1900 before the next intermediate degree correction. In my opinion what happens Monday & Tuesday to the dollar index will probably set the stage for market direction over the next month and into the election. This entry was posted in Uncategorized on September 30, 2012 by Gary. And as often happens right when you think you have a handle on what’s going on the market throws you a curve ball. 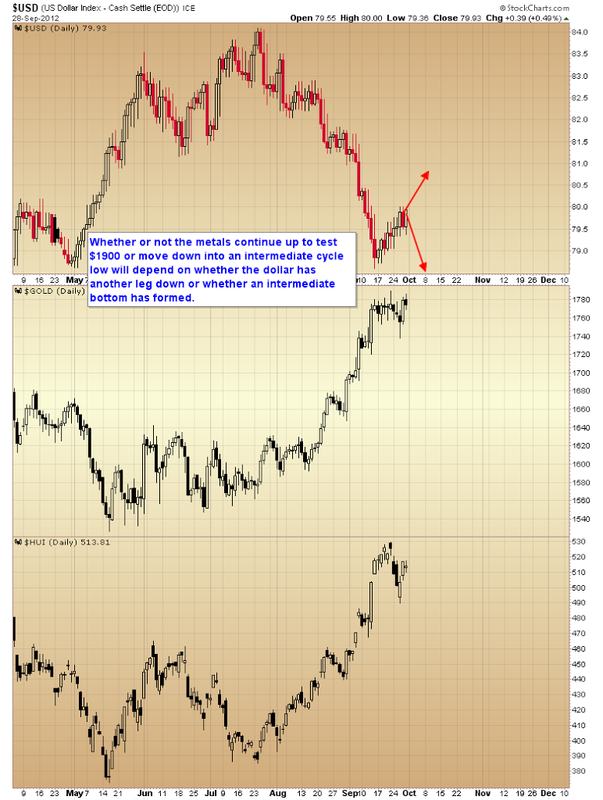 In order for assets to continue rising the dollar has to resume it’s downward trajectory. It didn’t do that today. That’s a warning sign that we may be on the cusp of an intermediate degree rally in the dollar, which would probably trigger an intermediate degree correction in stocks and precious metals. This entry was posted in Uncategorized on September 28, 2012 by Gary. 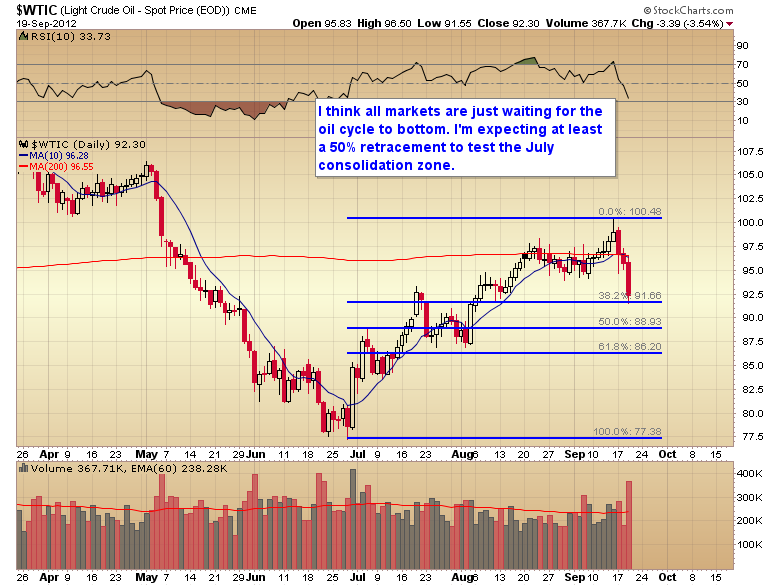 Oil has formed a swing and bounced off the 50% retracement I was looking at as a possible cycle low target. 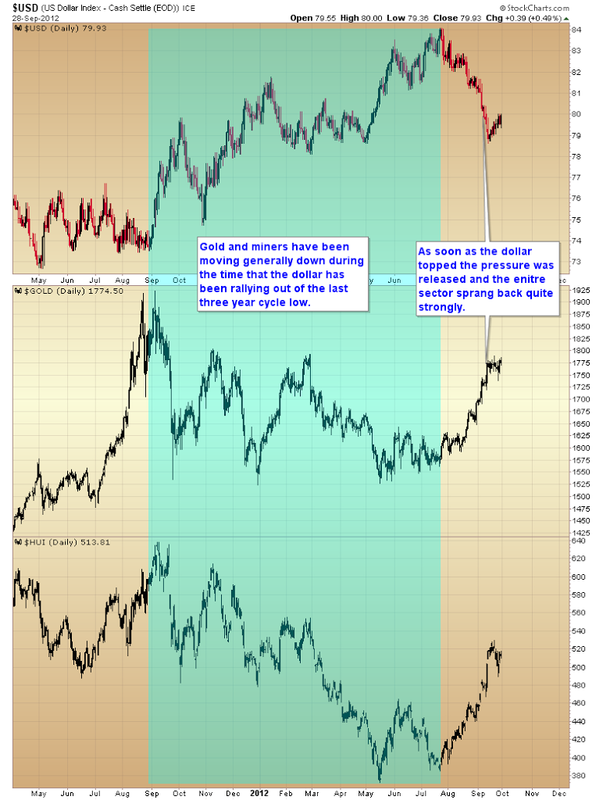 Gold, silver and stocks have clearly received the signal and are ready for the next leg up (which should mean the dollar cycle has topped and is ready for the next leg down). 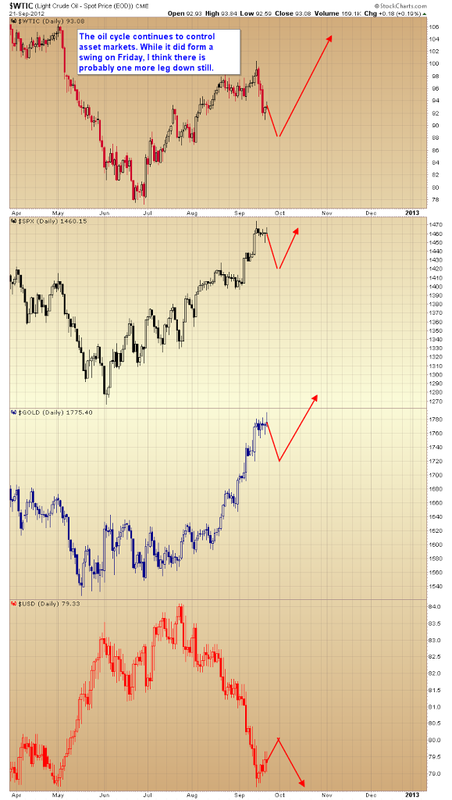 Stocks may be locked in a runaway move which I discussed in last nights report in the premium newsletter. This entry was posted in Uncategorized on September 27, 2012 by Gary. We will continue to watch the oil cycle next week as it is driving all other asset markets. 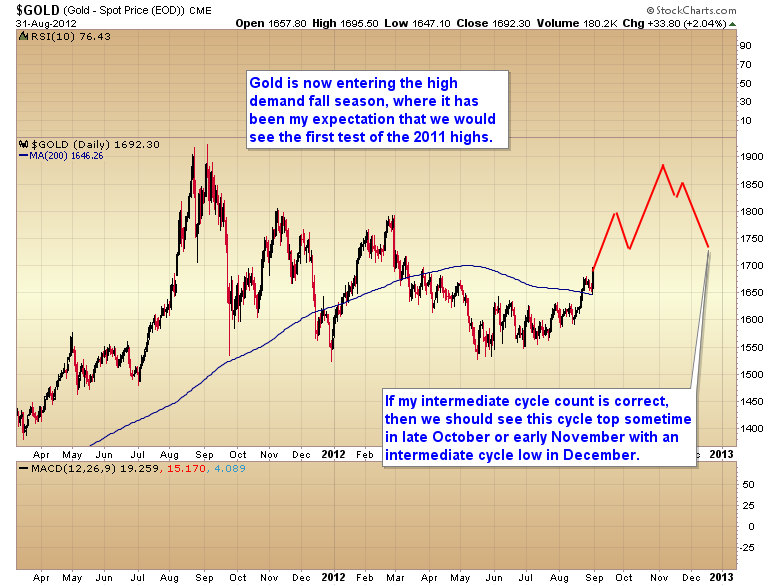 As I pointed out in my last article, the rally in stocks, commodities, and gold are on hold until the oil cycle bottoms. Oil did form a swing low on Friday, but I think there is probably one more leg down before the cycle forms a final intermediate bottom. If oil does have another leg down next week, that has the potential to cause the stock market to break lower out of the volatility coil that it has formed. As most of you probably remember the initial break out of a volatility coil ends up being a false move about 70% of the time. The initial break is soon followed by a more powerful and durable move in the opposite direction. In this case, a move down would form a stretched daily cycle low, which would be followed by, presumably, another move to new highs next month, and on into the election. A further decline in oil would probably mean more upside for the bear flag forming on the dollar index, and presumably the dip down into a daily cycle low for gold that I noted in my prior post (although I wouldn’t rule out one more attempt to tag the $1800 resistance level on Monday or Tuesday first). 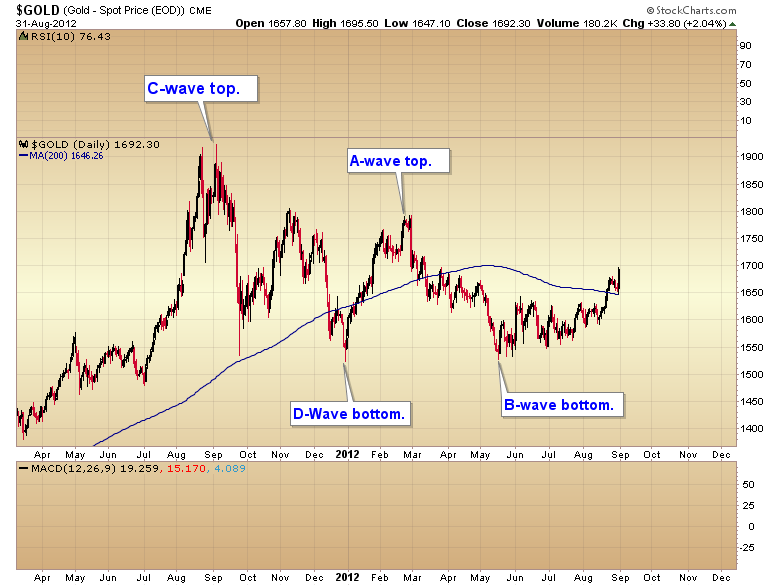 Note that the above charts are only intended to illustrate trajectory not actual targets. This entry was posted in Uncategorized on September 23, 2012 by Gary. There will be a lot to go over in the weekend report, but basically everything is now in place for my inflationary shock in 2014 scenario, including the stock market at new highs, which has now already happened. This entry was posted in Uncategorized on September 14, 2012 by Gary. This entry was posted in Uncategorized on September 12, 2012 by Gary. Unfortunately as so often happens with blogs that aren’t purely a bear blog, the SMT has deteriorated to the point where it’s mostly inhabited by trolls. The conversation has gotten to the point where it no longer serves any purpose, other than to offer a stage for the trolls to rant. At this point I will be closing the comments section of the blog for the foreseeable future. If you want to join the discussion then you will have to be a member of the premium website from now on. This entry was posted in Uncategorized on September 11, 2012 by Gary. HAS QE3 ALREADY BEGUN? 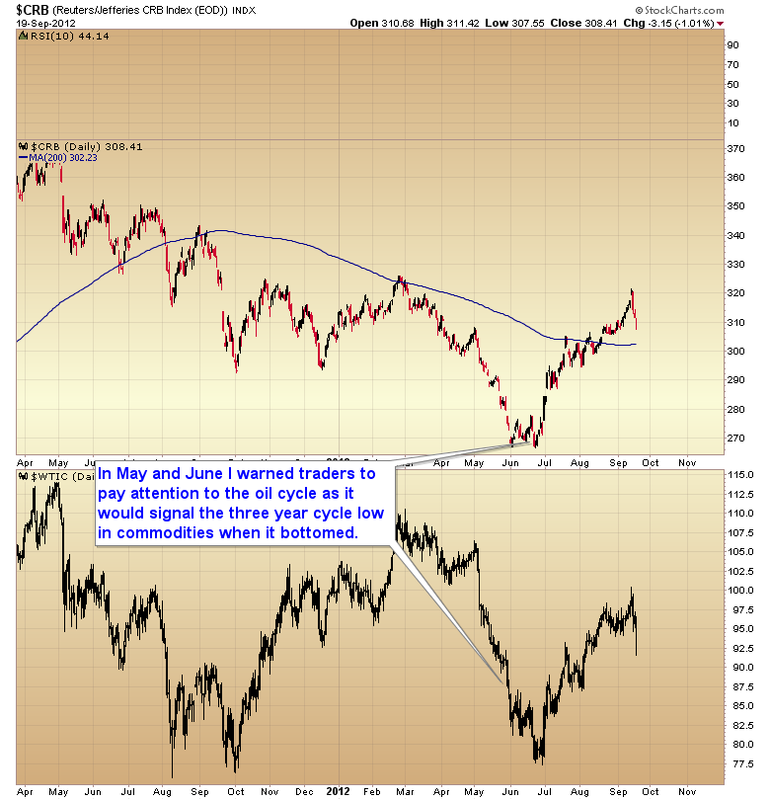 COMMODITIES AND GOLD MAY BE SAYING YES. According to recent statements by Bernanke, the Fed stands ready to act with further easing of monetary policy (QE3) if economic conditions warrant it. But let’s face it, because the Fed has never been audited we only receive the data they deem fit to publish. We know the government lies to us about inflation, unemployment, GDP, etc. Does anyone really believe the Fed is publishing true accounting numbers? I’m starting to suspect Bernanke has already begun the next round of quantitative easing. Politically QE is a hot potato, and impossible to publicly announce. But there have been enough hints (the last FOMC minutes maybe the loudest) that it is clear that Bernanke intends to print. Hey, we are in a currency war after all, and one can’t win the war if you don’t shoot your guns! First case in point. 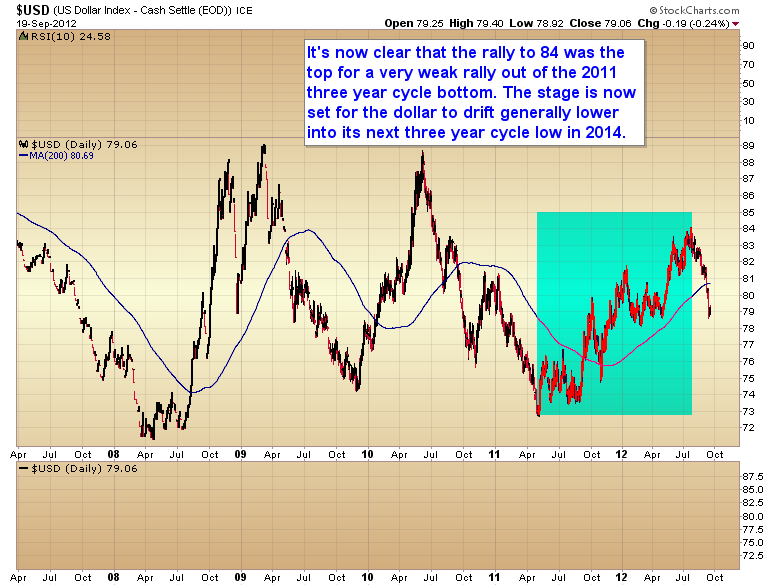 The CRB exploded out of its three year cycle low in June just as I had predicted. Oil is already knocking on the door of $100 a barrel again. Grains in many cases have rallied 50% or more and show no signs of reversing. 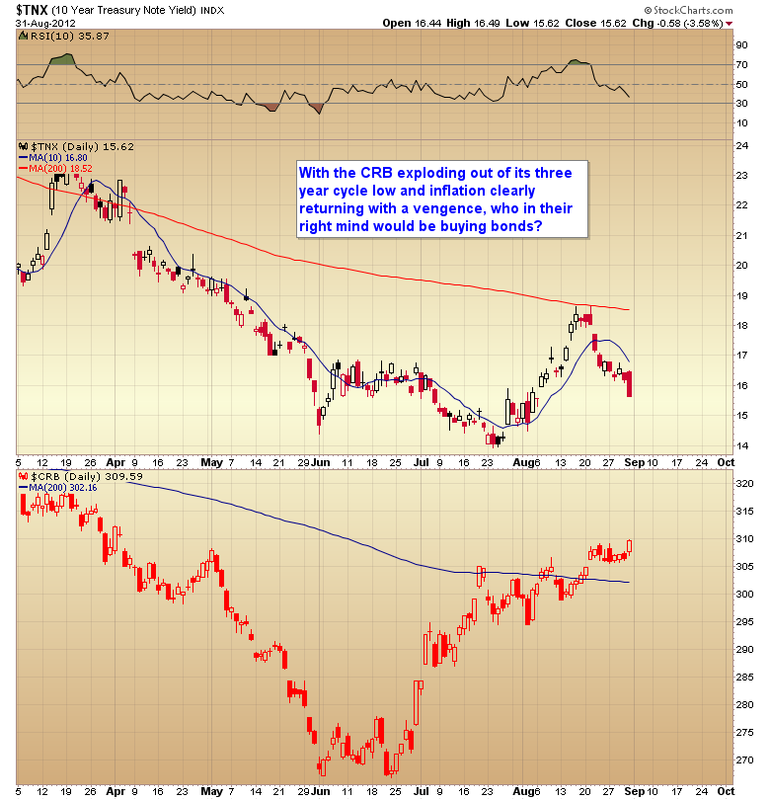 As a matter of fact, the CRB is showing no inclination to even retest the summer bottom. The complete failure up to this point of commodities to retest the three year cycle low is of itself a warning bell that something has changed. I think we can all agree that the global economy didn’t all of a sudden ratchet into high gear, creating a surge in demand. Barring that, the only thing that would generate this kind of explosive move without even a hint of a correction would be another round of massive liquidity injections. Another odd development is the action in bonds. A month and a half ago the bond market started to discount the inflationary surge as commodities launched out of their three year cycle low. Mysteriously, two weeks ago, interest rates started to tank. One has to ask themselves, who in their right mind would be buying bonds with a negative yield in a rapidly accelerating inflationary environment? This sudden reversal in interest rates is another warning bell, in my opinion, that QE3 may have already begun, and Bernanke is already buying bonds in the attempt to hold interest rates under 2%. The next confirmation will come from the stock market. As we have seen in the past, the daily cycle in the stock market has tended to stretch far beyond its normal timing band (35-40 days) during periods of quantitative easing. 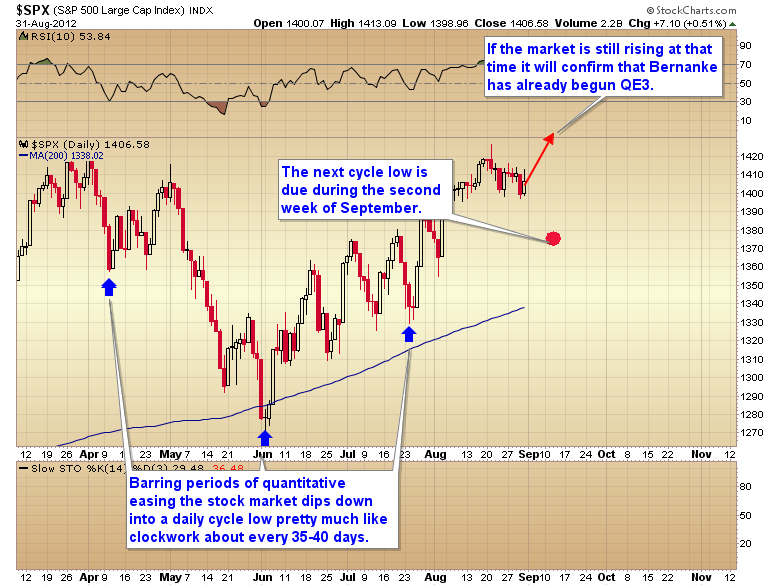 The current cycle is due to bottom right around the next Fed meeting on September 13. If stocks are still rising with no clear decline into a cycle low by mid-September that would be a pretty clear sign in my opinion that Bernanke is lying to us and QE3 has already begun. If I am correct then the penetration of the three year cycle trendline by the dollar index on Friday is going to be a harbinger of hard times ahead for the world’s reserve currency. As many of you may recall I’ve been expecting the three year cycle low in the CRB to correspond fairly closely to a top in the three year cycle on the dollar index. So far the rally out of the May 2011 three year cycle low has been very weak. The dollar still isn’t close to moving above the 2008-2011 three year cycle high, and has now formed a monthly swing. 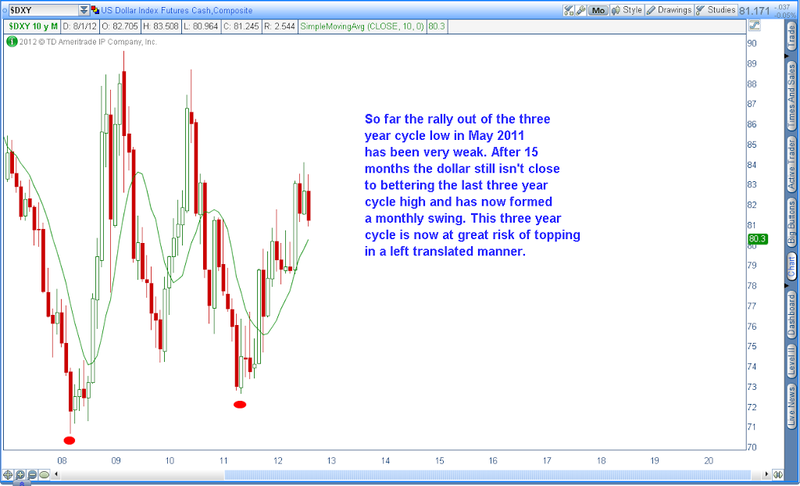 The dollars three year cycle is now at risk of having topped in only 14 months in a left translated manner. If so, this greatly increases the odds that we will see the dollar index fall below 72 and probably below 70 by the time the next three year cycle bottoms in mid-2014. If the dollar’s current daily cycle continues to drop all the way into the FOMC meeting on September 13, then it will be unlikely we see any significant corrective action in commodities or stocks for the next two weeks, and at that point I am going to seriously entertain the idea that the Fed is lying to us and has already begun the next round of bond purchases. The big question though, is how do we invest based on this possibility? First off one doesn’t want to be short if there is even the slightest risk that the Fed has resumed bond purchases. Second, one has to ask themselves which sector stands to benefit the most from another massive increase in liquidity? The obvious answer is commodities. 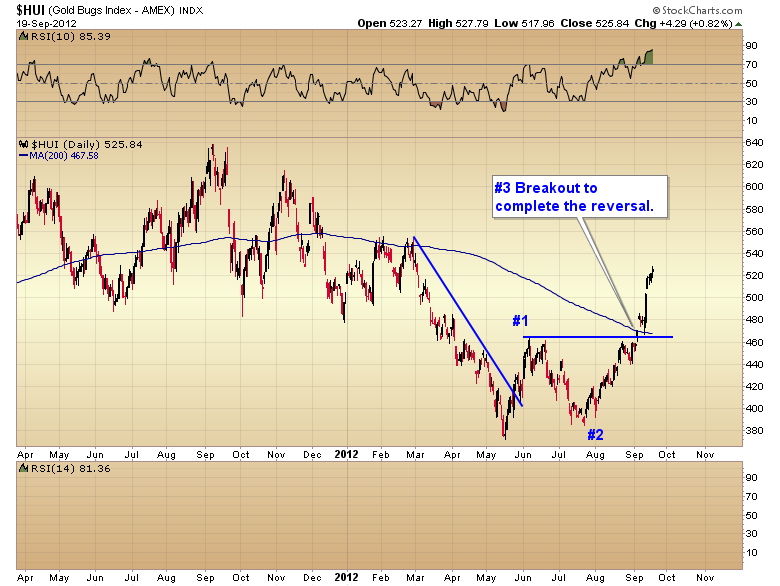 But most commodities have already rallied quite significantly as we’ve seen with the grains and energy. That doesn’t mean there isn’t more upside, I’m sure there is. But I think much larger percentage gains are going to be made in the precious metals as price and breadth are still quite depressed in this sector. The metals are now set to “catch up” as traders take profits on some of their other commodity positions that have already generated large gains, and look to put that capital back to work in undervalued areas with more upside potential (precious metals, especially miners). 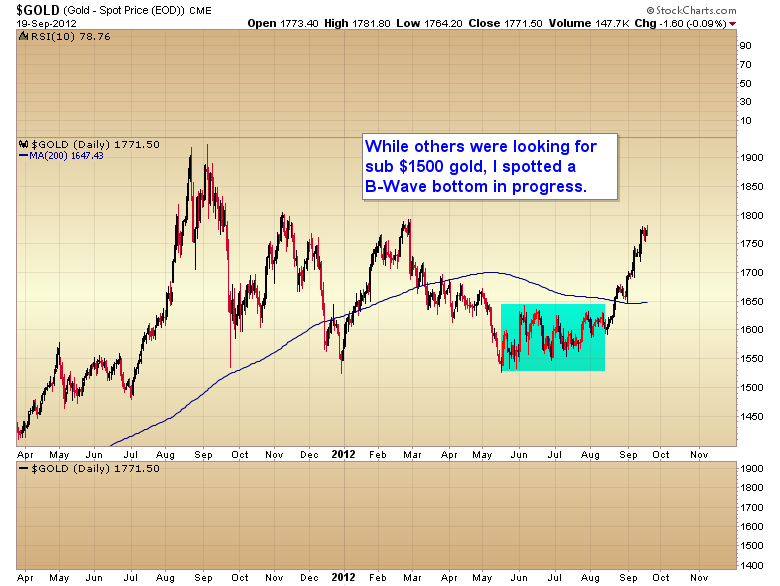 It’s been my theory for several months now that we saw a B-Wave bottom for gold back in May. 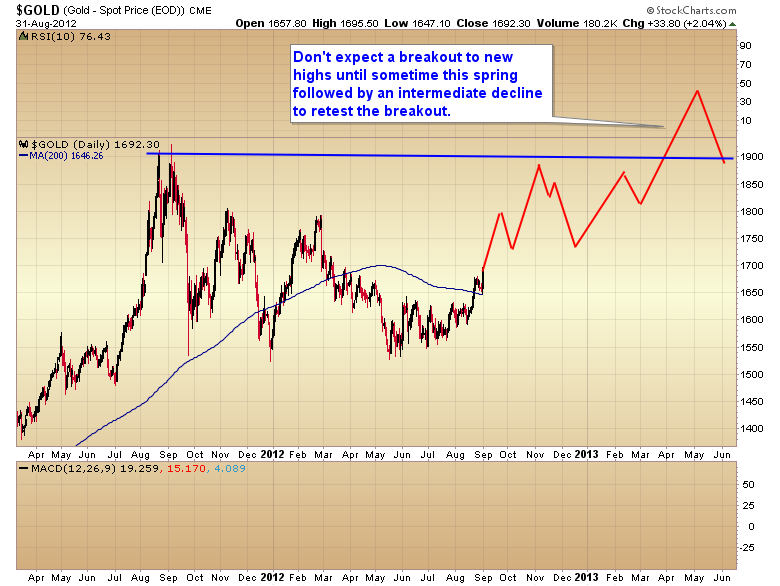 With the recent breakout of the frustrating consolidation zone that always follows a B-Wave bottom, I think gold is now ready to begin the initial phase of the next C-wave advance. Following an intermediate degree decline in late November to mid December the breakout to new highs should occur during the next intermediate cycle this spring, followed by a retest of that breakout at the next intermediate bottom. Yes I know these daily and intermediate cycle counts are some what complicated and beyond the scope of this short article. 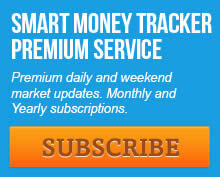 I do cover them extensively in my premium newsletter. Suffice it to say that cycle analysis lays a general guideline for when to expect major bottoms, and to a lesser extent tops. I like to think of it as a tool that signals when to step on the gas and when to start tapping on the brakes. 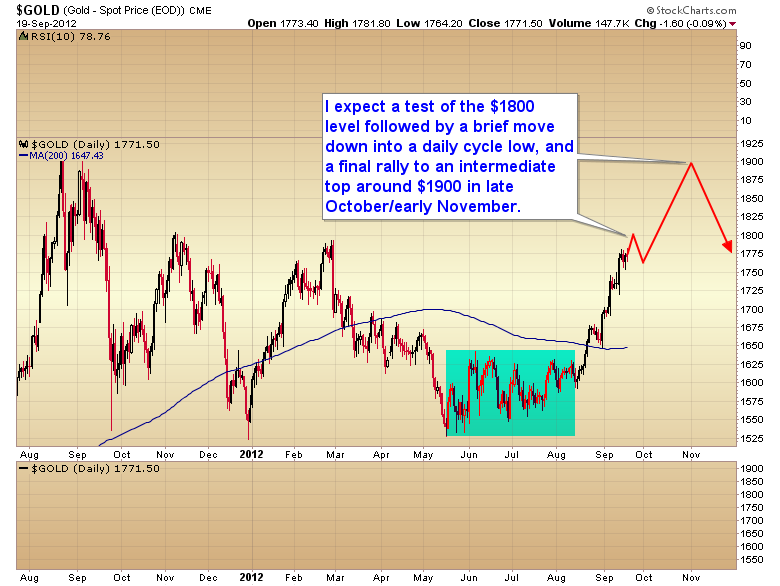 While I don’t think gold has much chance of moving above $1920 this year, conditions are definitely in place for a significant rally in the sector over the next couple of months. Miners, and silver in particular, have the potential to generate some pretty respectable gains over the next 2-3 months. This entry was posted in Uncategorized on September 3, 2012 by Gary.